Radio Mi Amigo is named after the legendary radio ship: the MV Mi Amigo, the longest serving (1958 -1980) pirate radio ship in history. 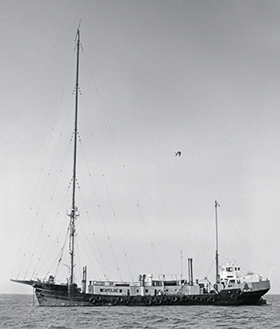 She became most famous as Radio Caroline's ship, but also was home to radio stations 'Radio Nord' (Scandinavia), Radio Atlanta, Radio Seagull, Radio Atlantis, Radio Veronica and of course Radio Mi Amigo, the successful Belgian/Dutch station operating in the mid-70's. 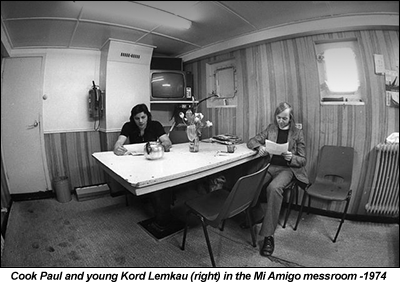 Many famous DJ's and announcers, such as Johnny Walker, Robbie Dale and Tony Blackburn started their careers out on the MV Mi Amigo. DJ's and crew that served on the ship called her respectfully 'the Old Lady', because she was so gracious and had such turbulent history. In the seventies she was secretly financially backed by 2 ex-Beatles: George Harrison and John Lennon. Programmes for the original Radio Amigo were recorded in 2 studios in Playa d'Aro, Spain, where management and DJ's lived in exile on the Mas Nou mountain behind this tourist village. 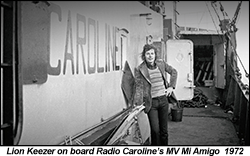 When the offshore days came to an end, a young German, Kord Lemkau, -who was involved with Radio Caroline and the MV Mi Amigo in Holland in the early seventies- decided to continue the station on land, finding a nice location on the Spanish Canary Islands. There he started his first Radio Mi Amigo as a local FM station. 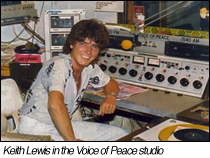 Kord later moved to the Spanish mainland and settled in Alicante, where -until today- he owns and operates 2 powerful FM transmitters, serving the entire Costa Blanca as the modern 'Radio Mi Amigo', mostly with programmes in German for expats and tourists. But -like many of us- Kord never forgot his roots: the original Offshore Radio AM sound and the spectacular music from that era. Starting out as a hobby, he hired airtime on several Shortwave- and Medium Wave transmitters in Germany and Latvia, giving birth to what we now know as 'Radio Mi Amigo International'. 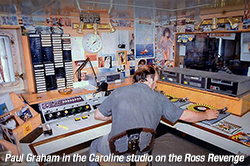 Its broadcasts can now be heard daily throughout all of Europe and even beyond, 'Bringing Back the Golden Era of Offshore AM Radio'. Some of them had successful careers in Radio long after the ships closed down. Our current crew is a truly international bunch. They come from the UK, Holland, Germany, Belgium and the US. All share the love for free radio - especially the way it sounded 'when pirates ruled the airwaves'. And so true free radio continues, using today's technology such as modern studios, a more contemporary presentation style and additional internet web streams. But... still with that original free-radio spirit and totally free of the harsh formats and rules that often makes today's radio sound boring and impersonal. Our DJ's have not forgotten where they came from. They are free to choose and pick their own songs, tell their own stories as if they were still sitting in that small studio on that magical ship somewhere at sea. One big difference is that they don't have to wait for a tender to bring mail from their listeners. On this website you'll find their bio's and also their private email addresses so it's easy to communicate and play requests and our listeners favorite artists. Some of the DJ's archive their shows on Mixcloud, so you'll never have to miss anything. Today's Radio Mi Amigo does not sound like 'any ordinary Oldies station'. We don't just look at old charts and play their top-10 hits. We always try and find those special songs that somehow bring back a memory or bring a smile to your face. The great offshore hits, sometimes one day wonders, B-sides, forgotten hits or great album tracks... all have one thing in common: they still sound great today on AM and are guaranteed to take you back to 'the Golden Era of Offshore AM Radio!